iSkysoft SyncPod for Windows transfers videos, songs, Pictures and TV shows between iPhone/iPod and PC for you. It provides you an easy way to copy and transfer music and video to iPod/iPhone without the help of iTunes. 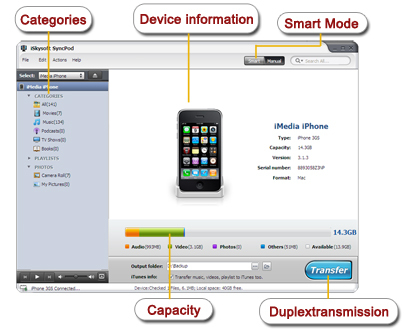 It also converts video and audio files to iPod or iPhone friendly ones simultaneously when moving files from hard drive to iPod or iPhone.Transfer iPod, iPhone and iPad files to computer. Backup iTunes Library. Music, movies, and photos can be all transferred. It supports all iPod devices, iPhones as well as the latest iPad. Get back your music and movies from iPod or iPhone to iTunes Library will be updated simultaneously. It copies iPod, iPhone or iPad music or movies to your friends' iPod or iPhone all by itself. Helps you transfer music, movies, TV shows and photos from your old PC to your new one, or from your old iPod to your new device when you just got a new one. An easy way to drag files one by one without being synchronized all together when copying music, movies and photos from both different computers to your iPod, iPhone or iPad. Qweas is providing links to iSkysoft SyncPod for Windows 2.0.0 as a courtesy, and makes no representations regarding iSkysoft SyncPod for Windows or any other applications or any information related thereto. Any questions, complaints or claims regarding this application iSkysoft SyncPod for Windows 2.0.0 must be directed to the appropriate software vendor. You may click the publisher link of iSkysoft SyncPod for Windows on the top of this page to get more details about the vendor.